A day in the life with Spencer the American Pit Bull Terrier puppy. Spencer's 33rd week—42 weeks old, 79 pounds, 22 1/2 inches from the ground to the highest point of the shoulders (the withers). 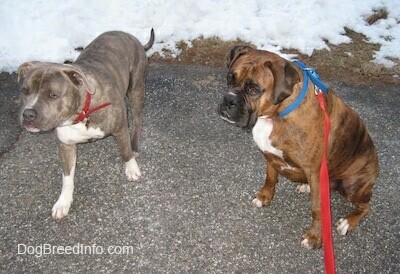 Spencer with his 3-year-old big brother Bruno the Boxer. 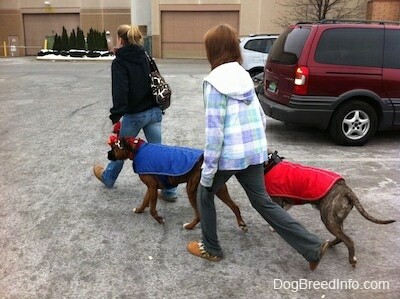 Spencer and big brother Bruno on their way to a dog friendly-store. More socializing for the pup. Bruno was lying on his side holding onto a stuffed toy. Spencer got a hold of the other end of the toy and dragged Bruno's 90-pound body across the living room floor. Not bad for a 9-month-old puppy. I didn't get a clip of the straight drag across the floor. It had happened before I could get my camera out. 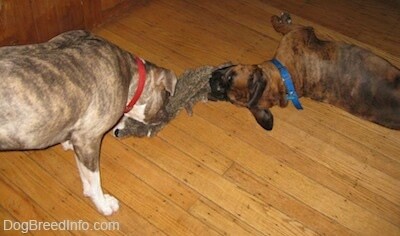 I did however get a clip of Spencer playing tug-of-war with this lazy brother, Bruno the 3-year-old Boxer. Spencer drags Bruno in circles while Bruno just lies there hanging onto the other end of the toy. Spencer for the most part has no problem going up and down steps. He does not have any steps to practice on at home since he is not allowed upstairs, a great boundary for him that he never even tries to cross. We go plenty of places where he does get to go up and down steps, however. In one house Spencer often visits that has stairs going to the basement/garage area, he goes up and down all of the time. 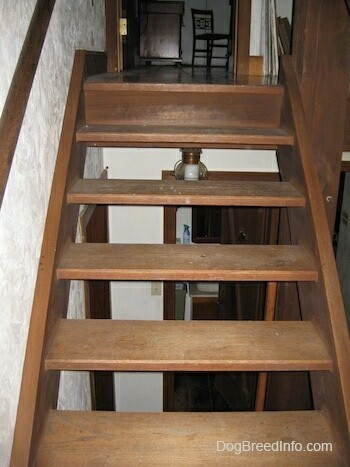 However, the steps going upstairs are a different story. Thinking about the way the pup studies and analyzes everything I can understand why. 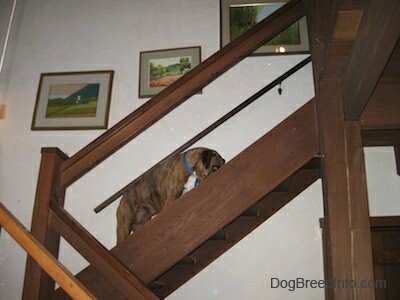 Unlike the other stairs, he can see through the steps down to the floor and to him that is just not right. Pup, you are going to have to realize that going up and down steps like these will not hurt you. Update: Amie tells me that when Spencer was younger the very first time he encountered a staircase of see-through steps someone came over and started petting him while he was afraid. She had asked the person to not pet him while he was afraid, however they continued to pet him and sweet-talk him. That was like saying,” good dog for being afraid. I agree with the way you are feeling right now.” Hmmmm, going to really have to work on getting him over this. We had tried treats to get him to go up, but no go. He cared more about his life than eating. I finally just took him by the collar and pulled him up the first two steps. At first he shook, however once he got past the third step he thought best to get to the top. I was careful not to laugh, sweet-talk or pity him or it would have made him even more scared. Staying strong for him is what he needed to feel from me. 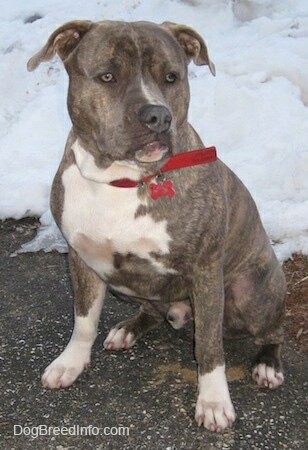 When Spence got to the top he did one if his Pitbull happy dances and gave me kisses. He was so glad to be up. Spencer was up and after a while we realized he was not coming down, even though everyone else had been downstairs for a while. Oh boy, time to show him coming down will not hurt him either. We tried food first. If food works it's my method of preference, however the food would only bring him to the first step and he would immediately jump back up the steps. As much as we tried with food, he just didn't see food worth the risk. I walked up to the top of the steps, took him by his collar and gently but very firmly like a momma bear said, "Come on... Come on..." in an “I mean it” tone. Spencer started walking down the steps with me holding his collar. He was doing well so I decided to just let go of him. The pup made it to the bottom on his own and was once again doing his Pit Bull happy dance. 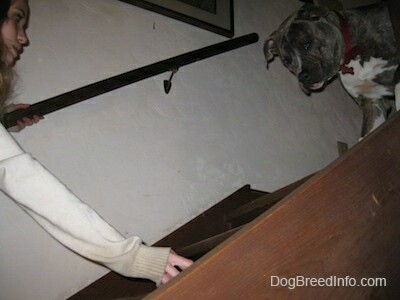 We are going to practice going up and down steps such as these whenever possible so he gets over his fear. As for Bruno? I don't think he thinks enough to be afraid of steps he can see through. He goes up and down with no problem and always has. 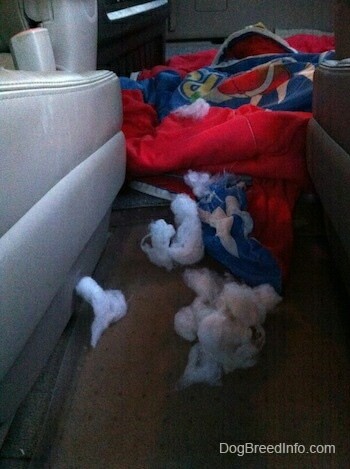 Spencer, Spencer, Spencer, please don't pull the stuffing out of this old sleeping bag. OK, in all fairness the bag already had a hole in it, but the stuffing was staying in there just fine without being sewed. Until you decided to pull it out. I may have wondered if it was Bruno that did this, but that piece of stuffing that was hanging off of your lip was enough evidence to know it was you. Time to toss this old thing. Not the best thing to use as a dog blanket and the kids are too big for this small Pokemon sleeping bag. R.I.P. Pokemon.